October 11th, Holly Drake will be teaching on her favorite obsession, Wild Edible Plants…a Thursday evening from 6:30- 8:30 p.m. The event is sponsored by New Life Fellowship church (1197 Old Highway 421 South Boone, NC 28607). Learn how to reclaim these wonderful plants that have been valued for generations past for food and healing. We are surrounded by a great variety of highly nutritious and tasty wild blessings that are free for the knowing and the picking. Mexican, Oriental, Italian, Greek and American cuisine will feature wild edible plants harvested in season and prepared for you to sample and taste. You will go on a virtual plant walk with Holly as she harvests these plants from nature and then prepares them for this menu. She will also give a Powerpoint presentation on the value of learning to eat from God’s free grocery stores. There is no charge for this event but space is limited. RSVP at hollydrake56@gmail.com. and it was wonderful! I have dug out my somewhat dusty edible wild plants book and started just reading it. Thanks so much to all those who did all the hard work! awesome to hear that someone else is interested in the wild and free food god has blessed us with. i wish more people where interested in the knowledge that is steadily being lost to the supermarket. Holly hope all is well for you and yours. I’ve noticed a marked decline in articles this year. Perhaps you have other venues and no doubt you are very very busy. Just wanted to mention how it was so interesting and inspiring to see your entries as the seasons went by and variations of uses of wild plants as they moved through the season. It may have only been these seasons you had to share with us. They are very treasured. Thanks for your time and insights. Charles, your comment really means a lot to me. I have indeed found a quicker way to capture my wild wanderings and that is Facebook. Nature’s wave has flown by so fast and furious and I have treasured each day and each wild discovery and preparation. 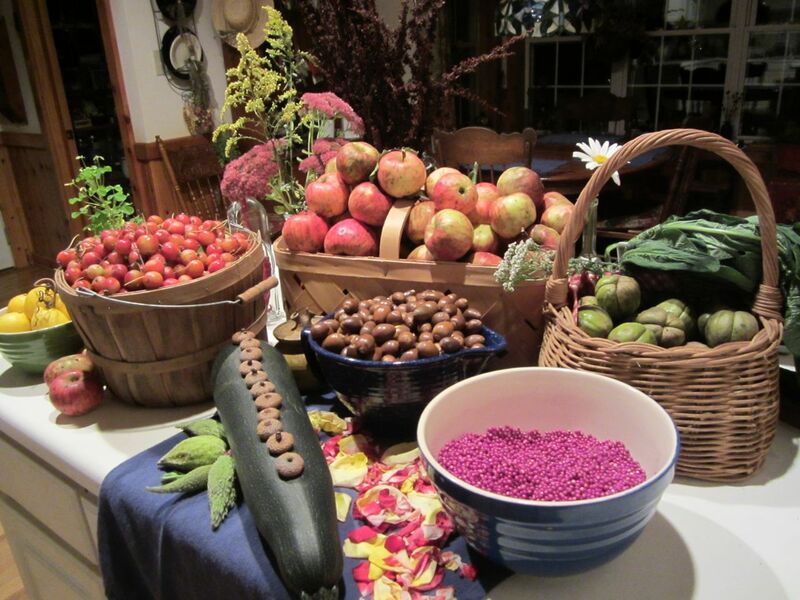 I have taken hundreds of pictures and written short summaries of my forager’s basket contents and what I did with them. I have also spent a great deal of time teaching in various settings. My goal is to use those archives to write a book this Winter. I’m thinking of calling it Riding Nature’s Wave, celebrating creation as the gift it was meant to be or foraging and feasting through the seasons… All of that is up for grabs. But the concept is solid and would be so educational. Making it an eBook I could incorporate photos with out the expense of print and show every phase of the plants and how to prepare them for supper or for Winter storage or even personal healing. I’m also working on a companion board game for children on foraging which I hope will light many wild fires and reconnect the most disconnected generation ever with their roots and with nature. So excited about these possibilities. It all just takes time. Which is hard to come by, so I have resorted to a much easier way of recording and uploading photos than a blog. Now that roots and barks and a few Winter greens are the only things beckoning to me to harvest, and many hundreds of jars of wild foods have been fermented, pickled, jammed, jellied, dried, frozen, deshelled…. I hope to turn my attention to these goals and my blog will revive. God bless you and thanks for caring! i am doing the same thing you are doing. im not as far along though. thanks for encouragement.